The benefit of exercise throughout life has always made headlines. But is it safe for seniors to exercise? Absolutely! Regular exercise can prevent chronic disease; improve mood and lower chances of injury or illness. Generations at Oakton wants to help seniors’ start a new exercise routine that is exciting as well as beneficial for their health. At their upcoming Senior Resource Fair, there will be a special exercise demonstration that showcases various ways to keep moving! Regular exercise also lowers the risk of heart disease and high blood pressure, protects against loss in bone mass, and helps boost seniors’ metabolism. It’s not only these demonstrations that Generations at Oakton will showcase. Board certified internist Dr. Papanos will be presenting on topics which include heart health, diabetes, cholesterol and more. Also, they will be checking blood sugar & blood pressure; scheduling flu shot appointments with the help of Walgreens and offering chair massages with an on-site chiropractor and massage therapist. 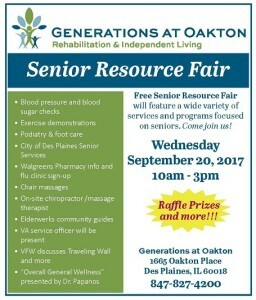 To learn more about these wellness habits as well as collect information on services for seniors; attend their free resource fair on September 20th at Generations at Oakton located at 1665 Oakton Pl, Des Plaines, IL 60018 from 10 am- 3 pm. Come and enjoy refreshments, a spread of healthy treats and even win some awesome raffle prizes!